I saw this on my brother’s time line a few day’s back. It seemed astonishing that an individual would be running in this age. But then I read this article on CBC news. He completed the Toronto Marathon of 42.1 KM in 8Hr’s 25 Min. Being the faithful internet addict that I am, I instantly asked Lord Google to tell me more about him. There it was Fauja Singh (born April 1, 1911). Known by old timer of his village that he used to run every where when he was young. But he did not start running marathon’s till he was 89. That’s right 89 years of age. That’s the time most people hang up their boots to dry. As I read up I noticed that he had suffered the loss of his son and wife about 20 years back. But instead of letting that put him down he reinvented himself. Set a new target and always looked at the positive. Now at a 100 year’s plus of age look at what he has accomplished. I’m going to paste an excerpt from Wikipedia here. 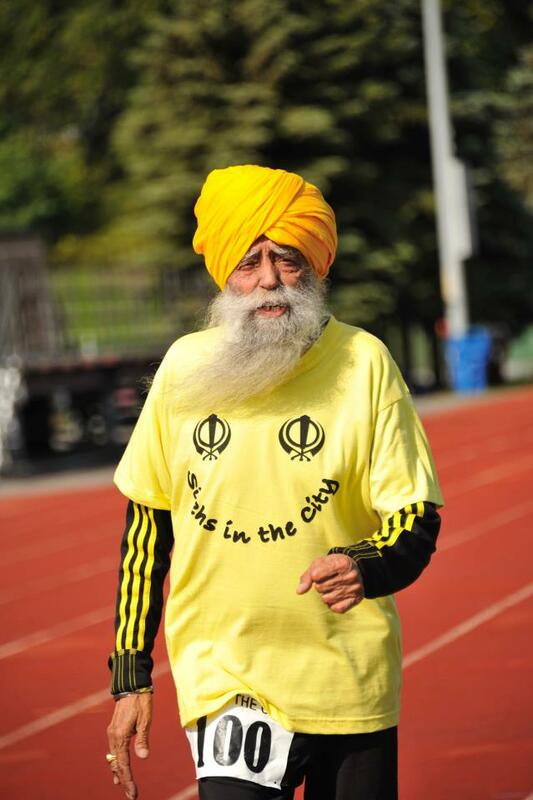 At the age of 100 (and a half), Singh attempted and accomplished eight world age group records in one day, at the special Ontario Masters Association Fauja Singh Invitational Meet, held at Birchmount Stadium in Toronto, Ontario Canada. Timed by officials in Canada, Singh ran the 100 metres in 23.14, 200 metres in 52.23, the 400 metres in 2:13.48, the 800 metres in 5:32.18, the 1500 metres in 11:27.81, the Mile in 11:53.45, the 3000 metres in 24:52.47 and the 5000 metres in 49:57.39. That is something to put it as lightly as I can. I’ve taken an image from a Mr. Sean Wallace-Jones on FB here. Check out the entire gallery at his page. Mr Fauja Singh should be an inspiration to us all. 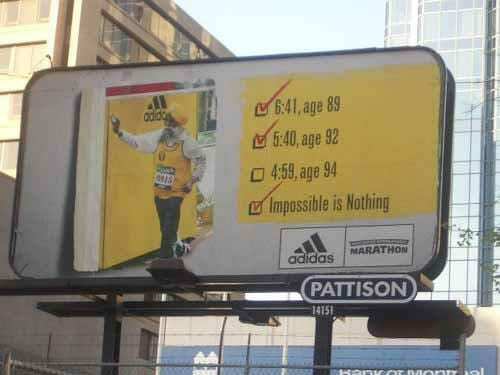 He really lives upto his Adidas banner “Impossible in nothing“. He shows us that we should always look towards the positive. Don’t let the negative energy consume. There is always light at the end of the dark tunnel. None of us should be able to make any excuses after reading about him about being too old to start working out. Actually we shouldn’t be able to make excuses about anything. He shows that if you put your mind to it, you can achieve anything. Hat’s off to you. May you keep running in the many years ahead.